The CDS range of metal cased monitors are a special product range designed to address CCTV and other applications that require the ability to connect video signals using BNC connectors. All of the monitors in the range have at least one BNC input and several, depending on the screen size, have dual BNC inputs and the ability to display two separate video pictures at the same time. The 42" monitor can accept 4 x video inputs via BNC connectors and display 4 separate pictures using the integrated Quad display unit. In addition to the BNC connections these monitors, apart from the 5" display, also have a VGA connection and all of the monitors from 15" up also have a HDMI input. Another feature of this range of monitors is that it includes 7 models that have a 4:3 aspect ratio with the remaining four units being the standard 16:9 ratio. The monitors all use commercial grade professional LCD panels with LED Backlight technology and from 15" up, all of them include multimedia speakers. Most of the monitors are designed to be desk mounted but a few have a VESA standard mounting enabling them to be attached to the wall. Please see the literature for detail of the mounting for specific product sizes. 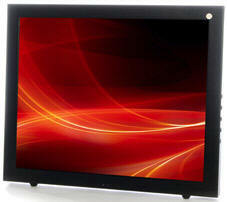 These monitors have many uses such as in CCTV monitoring and TV studios. Screen resolutions are from 640 x 480 pixels on the 5" panel to full HD (1920 x 1024) on the 42".